From the Nagari and Persian inscriptions on the minar, it appears that it was damaged twice by lightning, in 1326 and 1368. 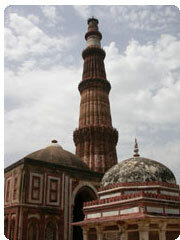 The first damage occurred during Muhammed Tughluq's reign (1325-51), and was repaired by him apparently in 1332. The second damage was attended by Feroze Tughluq (1351-88). Later in 1503, Sikandar Lodi (1489-1517) also carried out some restoration in the upper storeys. 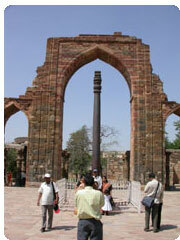 Originally the minar had only four storeys, faced with red and buff sandstone. The uppermost storey, which was damaged in 1368 during Feroze Tughluq's reign, was replaced by him by two storeys, making free use of marble but leaving the lower portion of the fourth storey built with sandstone in its original condition. The original three storeys are each laid on a different plan, the lowest with alternate angular and circular flutings, the second with round ones and the third with angular ones only, with the same alignment of flutings, however, being carried through them all. Its projecting balconies with stalactite pendentive type of brackets and inscriptional decorative bands on different storeys heighten its decorative effect. It has a diameter of 14.32 m at the base and about 2.75 m on the top. With a height of 72.5 m and 379 steps, it is the highest stone tower in India and a perfect example of minar known to exist anywhere. There exists a tradition that the Qutub-Minar was built by Prithviraj, the last Chauhan king of Delhi, for enabling his daughter to behold the sacred river Yamuna, from its top as part of her daily worship. The Minar's entire architecture, however, bespeaks an Islamic origin, with two of its prototypes in brick still existing at Ghazni, although Hindu craftsmen were certainly employed for its construction, as is evident also from certain 'Devanagari' inscriptions on its surface. 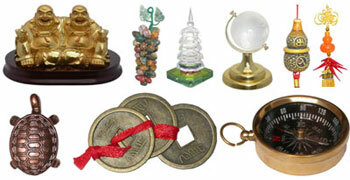 Sometimes sculptured stones from temples have been found utilised in it. Originally, it was surmounted by a cupola, which fell down during an earthquake and was replaced early in the 19th century with a new cupola in the late Mughal style, by one Major Smith. It looked, however, so incongruous that it was brought down in 1848, and may now be seen on the lawns to the south east of the minar. Just adjacent to the tower is the mosque of Quwwatu'l-Islam Masjid, which can become a bewildering experience for those who are not familiar with its history. It was supposed to have been built using the materials and masonry of the remains of Hindu Temples and architecture. On one hand there is the beautiful, exceptional Islamic handwriting and brocaded designs. Then there are pillars with clearly pre-Islamic Hindu motifs. The reason is that the pillars were taken from the 27 temples of Qila Rai Pithora, the city of the Rajput king Prithviraj Chauhan. This in fact has been recorded by Qutub-ud-Din in his inscriptions, who call it the Jami Masjid (Friday Mosque) in his inscriptions. The mosque was started in 1192 by Qutub-ud-din Aibak, the first ruler of the Slave Dynasty and was finished four years later. In the courtyard of the Quwwatu'l-Islam mosque stands the famous iron pillar, which bears a Sanskrit inscription in Gupta script, palaeographically assignable to the 4th century, a date which is also confirmed by the peculiar style of its 'Amalaka'-capital. The inscription records that the pillar was set up as a standard or dhvaja of god Vishnu on the hill known as 'Vishnupada', in the memory of a mighty king, named 'Chandra', who is now regarded as identical with Chandragupta II (375-413) of the imperial Gupta dynasty. A deep hole on the top of the pillar indicates that an additional member, perhaps an image of 'Garuda', was fitted into it to answer to its description as a standard of Vishnu. The pillar has been brought here evidently from somewhere, else, as no other relics of the 4th century are found at the site. There is a strong bardic tradition that it was brought here - wherefrom, nobody knows - by Anangpal, the Tomar king who is credited with the founding of Delhi. The base of the pillar is knobby, with small pieces of iron tying it to its foundations, and a lead sheet covers the portion concealed below the present floor-level. The total length of this slightly tapering shaft is 7.20m, of which 93cm is buried below the ground. The metal of the pillar has been found to be almost pure malleable iron. Its portion below the ground shows some signs of rusting, but at a very slow rate. The manufacture of such a massive iron pillar, which has not deteriorated much during sixteen hundred years of its existence, is a standing testimony to the metallurgical skill of ancient Indians. A traditional belief says that any one who can encircle the entire column will have their wish granted. However, it is fenced off from tourists so as to avoid any damage. The ambitious rubble Alai Minar was started by Alauddin Khalji but the sultan lived to see it only to the height of 24.5m and no body was ready to complete his over-ambitious project. It was built to match the enlarged Quwwatu'l-Islam Masjid. Today it is used more like an illustration, by parents, that when you get over ambitious, the plans remain unfinished. The southern gateway of the Quwwatu'l-Islam mosque, as extended by Ala-ud-Din Khalji, is known as the Ala-i-Darwaza and among its several inscriptions executed to form an ornamental surface, three mention the date of its erection as 710 A.H. (1311). Alai Darwaza is the first building employing wholly the Islamic principles of accurate construction and geometric ornamentation and also betrays certain 'Saljuqian' characteristics, which had influenced the Khalji architecture. Important among these characteristics are wide and bulging dome with a central knob, pointed horse-shoe-shaped arches and squinches and lotus-bud fringes of the arches. The celebrated gateway, built of red sandstone, is 17.2m squares with arched openings on all sides, and is surmounted by a wide but shallow dome on an octagonal base achieved through squinches with concentric series of arches. The northern arch is semicircular, while others have a pointed horseshoe shape, with radiating voussoirs laid on the principle of true arch. The underside of the arches is fringed with lotus-bud embellishment, not merely in the openings, but also in the perforated side-windows. Its excellent proportions, profuse geometrical carvings on the interior, inscriptional bands of white marble in 'Naskh' characters and other decorative details in red stone make it a very pleasing structure. It has been rightly described as "one of the most treasured gems of Islamic architecture". The tomb of Shamsu'd-Din Iltutmish, son-in-law and successor of Qutub-ud-Din Aibak, lies to the northwest of the Quwwatu'l Islam mosque. 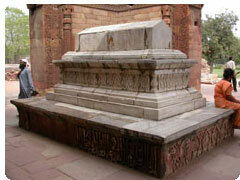 It was built in about 1235 by Iltutmish himself, only five years after the construction of Sultan Ghari's tomb. Yet, it is quite different from the latter and illustrates that phase in the development of Indo-Islamic architecture, when the builder had ceased to depend for material on the demolition of temples, although the arches and semi-domes below the squinches were still laid in the indigenous corbelled fashion. Its tomb-chamber with a cenotaph in its centre, internally nearly 9m-sq and faced with red sandstone, was certainly intended to be covered with a dome, as is clear from the squinches, which appear for the first time in this building. It is believed that the original dome had fallen and was replaced by Feroze Shah Tughluq, but even this did not survive. The interior on the west is occupied by three 'minhrabs' or prayer niches, the central one higher and ornamented with marble, to serve as a place for prayers, while the other sides are pierced by arched entrances. The tomb is plain on the outside, but is profusely carved on the entrances and in the interior with inscriptions in 'Kufi' and 'Naskh' characters with geometrical and arabesque patterns in saracenic tradition, although several motifs among its carvings are reminiscent of Hindu decoration. To this class belong wheel, bell-and-chain, tassel, lotus and diamond. In view of its lavish ornamentation, Fergusson described it as " one of the richest examples of Hindu art applied to Muhammadan purposes". To the southwest of the Quwwatu'l-Islam mosque lie some rooms and halls in ruins making an L-shaped block. They are believed to represent Ala-ud-Din's tomb and college or madrasa, which was started by him to impart instructions in Islamic theology and scriptures. The central room in the southern wing was perhaps his tomb. The conception of a combined college and tomb appears here in India for the first time and is perhaps inspired by 'Suljuqian' traditions.